Data Migration is one the critical and final phase in the ASAP Methodology road map. During this phase the cut over period is defined at which the data entry in legacy system is halted, collected and taken to migrate to SAP system. One of the crucial data to migrate during this activity is the Finance, based on accuracy of this your whole implementation is analyze because it is the final outcome or the result seen by the Management. 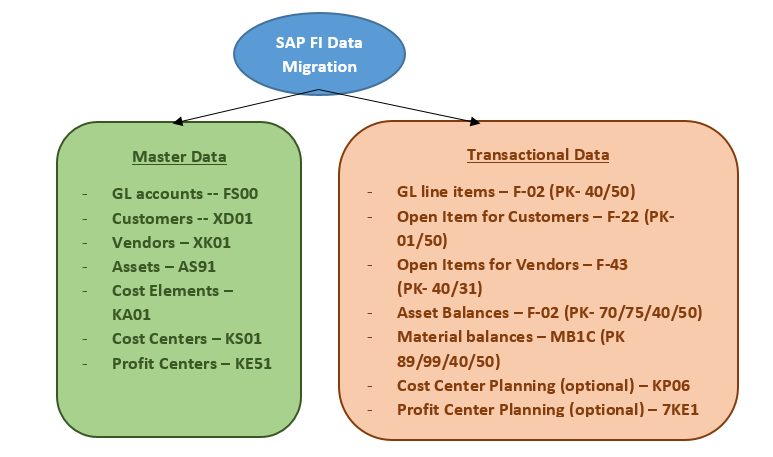 In this blog, I have discussed the data migration steps, techniques and procedures to migrate Financial data to SAP ERP. – Make LSMW Upload for t-code FS00. Extract template, Fill data and Upload. – Make LSMW Upload for t-code XD01. Extract template, Fill data and Upload. – Make LSMW Upload for t-code XK01. Extract template, Fill data and Upload. – Make LSMW Upload for t-code AS91. Extract template, Fill data and Upload. – Make LSMW Upload for t-code KA01. Extract template, Fill data and Upload. – Make LSMW Upload for t-code XS01. Extract template, Fill data and Upload. – Make LSMW Upload for t-code KE51. Extract template, Fill data and Upload. Closed the P&L in Retained earning account. Also, configure the Doc Type “UL” with separate No. ranges for Upload. After uploading the balances you can a pass an adjustment entry for these clearing accounts. Any way total balance for uploading clearing accounts should be zero. As, you have already created the Asset Master data through AS91, during which you have also enter Asset APV and Depreciation values (Asset takeover values) in Asset accounting module. 2nd Option for G/L posting is through t-code: OASV. In this you don’t have to use t-codes: OMAK & F-02. Balances are uploaded via t- code MB1C from MM side. The system would read the material master price for the plant and multiply the same with quantity of the material. This will be the value which will be updated as the stock value in the inventory account G/L as well as stock balance in Materials Management. In the above article the major focus is on the data migration steps and techniques used to migrate Finance data. If anyone want to acquired more knowledge on the subject matter, then it is requested to go through the below links in references. I appreciate the time you took to read this blog, hope this article is helpful and knowledgeable to the readers. Good Blog; however there are better options available for loading Assets (BAPI/iDOC) and for inventory there is a standard program available. LTMC is future in S/4 HANA while LSMW is not recommended.